Illustrated obscurity: Cambridge Satchel Co. I first heard about Cambridge Satchel Company maybe in early 2009. I saw a little blurb about them on NotCouture. I was looking for a school satchel for my daughter (who loves all things British) and thought it was perfect. I emailed the company directly to ask about the leather and how they were made, and corresponded directly with Julie Deane. She was lovely! And when she heard we were coming to London that summer, she invited us to stop at Cambridge and see the shop. (I still regret that we didn't have time.) Anyway, the bag arrived and my daughter, now a junior in college, still carries it every day. She says she's gotten a million compliments on it over the years. And the bag has held up fantastically well. Here's a great interview with Julie at Refinery 29. She's an inspiration to me. How would you sum up the working environment here? What kind of mood do you try to create? "I want it to be friendly. I want the factory and office to be somewhere where people feel proud to work. We employ 84 people now, and I know them all and I know their families. That’s really important to me. At Christmas when we’re super-busy, if someone’s child is in a school play, then we make sure that they go and watch it. I created this business because I wanted things better for my own children, and I’m not going to do that at the expense of other people’s families." 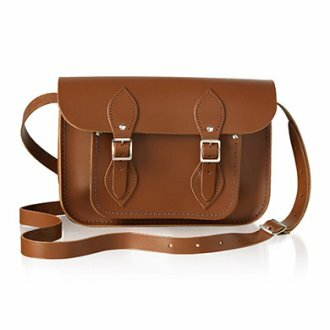 My daughter's bag: the Classic Satchel in vintage brown. No embossing. pic from cambridge satchel co. Youngest has a very similar satchel from Japan! I got my 1st Cambridge Satchel leather satchel around 2 years ago, i just love them, i got it with magnetic closure for easy access, they are the best!